Exfoliating can lead to a dramatic improvement, with skin looking more clear and glowing after just a couple of weeks of daily treatment. The ingredients to look for are salicylic acid (especially good for acne-prone skin), alpha-hydroxy acids, or glycolic acid (recommended for sensitive skin). Like retinol, these products should be used at night. Exfoliating creams, toners, pads – all of them will work. 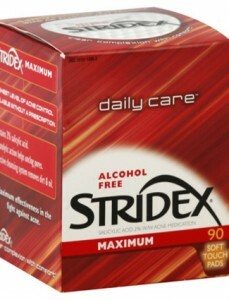 Stridex Daily Care Acne Pads ($4.29, Drugstore.com) with salicylic acid are good, and so is Neutrogena Healthy Skin Anti-Wrinkle Anti-Blemish Clear Skin Cream ($10.39, Drugstore.com), which contains both salicylic acid and retinol.